Also, please include your e-mail address and phone number on any check or money orders that you send us so that we can keep in touch. If you’d rather we didn’t, feel free to let us know. We take your privacy seriously and will not sell, rent, loan, give or share your personal information with anyone else. Contributions to Sierra Leone Village Partnerships, a tax-exempt organization under Section 501(c)(3) of the Internal Revenue Code, are deductible for computing income and estate taxes. SLVP is run entirely by volunteers. We spend next to nothing on marketing; our promotion efforts are free, sponsored or self-funded. All of our travel expenses, including site visits to Sierra Leone are funded out of our own pockets. This allows us to keep our administrative and overhead costs very low and funnel at least 97 cents of every dollar donated directly to our projects. The Pie Chart to the right reflects our spending for the last calendar year. 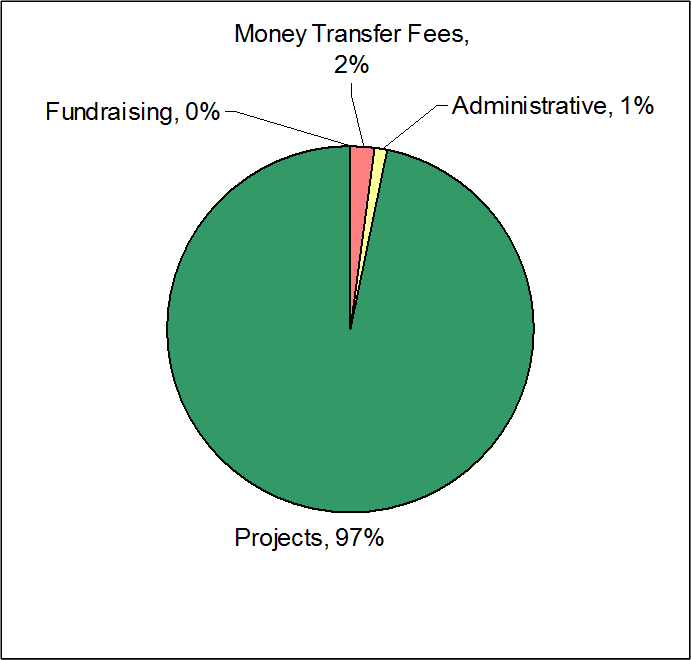 One of our organizational goals is to increase the percentage we spend on projects (97%), and lower the amount we spend on administrative costs (3%). We will never stop trying to maximize the percentage of donations that directly fund projects. But, as most non-profits that achieve at least a 75% are highly ranked, we are very proud of our 97%.